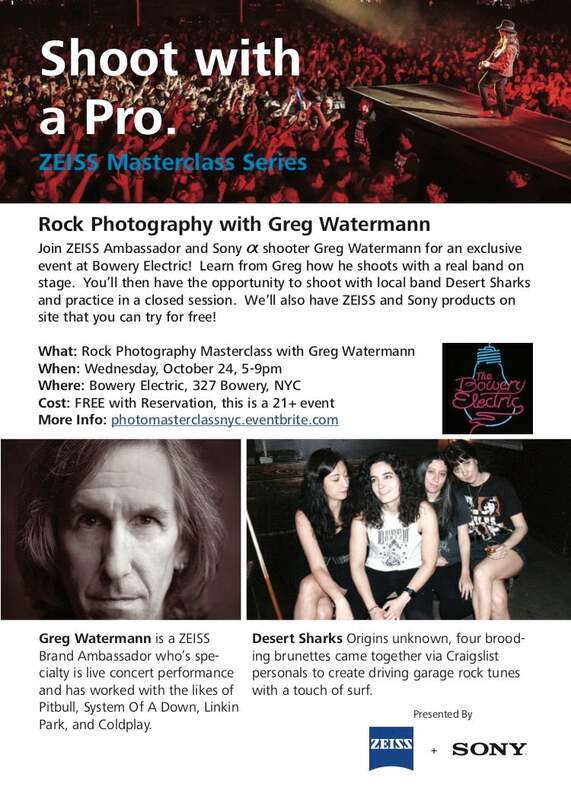 Join ZEISS Ambassador and Sony α shooter Greg Watermann for an exclusive event at Bowery Electric! Learn from Greg how he shoots with a real band on stage. You’ll then have the opportunity to shoot with local band Desert Sharks and practice in a closed session. Bring your own equipment to use, and we’ll also have ZEISS and Sony products on site that you can try for free! Be sure to stop at the ZEISS and Sony booths at PhotoPlus Expo afterward and share your experience with us! *Please plan to bring your own photography gear to this great event as demo equipment will be available on a very limited basis and will not be provided for all attendees.